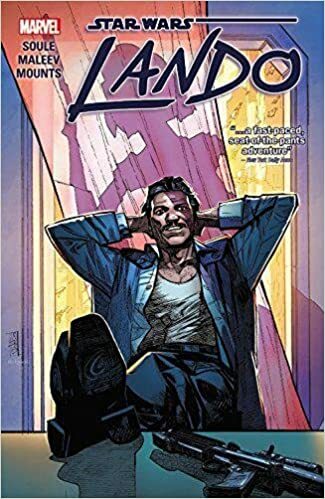 This is the Lando book you never knew you wanted. Trust me. I like Lando. You like Lando. Everyone likes Lando. The only problem is, most of us don’t have much exposure to Lando beyond the two Star Wars movies he’s in. Well, this book changes all of that. This graphic novel features our favorite space pirate doing what he does best: stealing, charming, plotting, and fighting. In all seriousness, Lando proved a breath of fresh air as it breaks from many of the Star Wars graphic novels and books in that it does not feature a main character saving a world, a village, or a child. I love those other books, but they seem fairly formulaic in that regard. This is a heist book, through and through. Who’s Lando trying to loot? None other than the Emperor himself, though Lando doesn’t know that. Taking place well before The Empire Stirkes Back and at only five collected issues, the author, Charles Soule, manages to deliver a lot of story, back story, and characterization in only a brief amount of time. Remember Lobot? He’s in Lando, and I’m positive his character will surprise you. We’ve also got an Ugnaught — you know, the little pig creatures. Furthermore, there are Royal Guards, a new bounty hunter, two new assassins, and an Imperial governor who makes a short, yet potent, appearance. Oh, there are also a few Sith relics that will prove quite interesting to you. Lando really is a page-turner. It’s fun. It’s got an interesting plot that doesn’t take itself too seriously yet has actual ramifications. Lando is a swindler, no doubt, but this book also shows us he has a heart of gold. It cuts to the absolute core of his being. It’s easy to believe that the Lando in this book will one day become a general in the Rebellion and beloved hero. I’d also like to mention Alex Maleev, the artist. Maleev won me over long ago with his seminal work on Daredevil. I wondered how the understated artist would transition from the streets of Hell’s Kitchen to the world of space fantasy. Not to worry, Maleev is top-notch and he can pretty much draw anything and make it look great. Make no mistake, the art in this book is distinctly Maleev — his style is unmistakable. Yet, even with his realistic depictions and moody tone, this absolutely looks like Star Wars. Lando is due for a major resurgence with Donald Glover playing the famous character in the new Han Solo movie, and if Glover interprets him anything like the Lando in this book, I know he will reclaim his previous glory. Like I said, this is the book you didn’t know you wanted. If you love Star Wars, you will love Lando. This entry was posted in Book Reviews and tagged alex maleev, arts, books, charles soule, comics, donald glover, entertainment, fiction, lando, lobot, marvel, read, reviews, star wars.